Lutron Electronics Co., Inc. has introduced a wall receptacle, listed for use with Lutron dimmers, that allows a table or floor lamp to be dimmed with a wall control without using a traditional lamp dimmer. This new UL-listed Receptacle for Dimming Use (RFDU) provides a National Electrical Code (NEC)-compliant solution for dimming portable lamp loads via a receptacle. 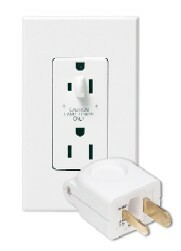 The RFDU is designed to only accept a special Lutron replacement plug and to mechanically reject all other plugs, including those of fans, heaters, vacuums, radios and televisions. To operate, simply install the replacement plug onto the lamp cord, and plug the replacement plug into the RFDU. The RFDU is UL-listed for use only with Lutron dimmers, including: Nova® and Nova T*, Diva®, Faedra™, Maestro® and Qoto™, as well as Maestro and Vareo®-style HomeWorks® dimmers, RadioRA® dimmers and GRAFIK Eye® preset lighting controls. The RFDU is available in 15A and 20A models in a variety of colors. For more information about Lutron Electronics, visit www.lutron.com. I have an inline exhaust fan in my attic that is plugged into an outlet up in the attic. can I replace the regular outlet in the attic with your dimmable outlet, plug the exhaust fan into your outlet, then put a dimmer switch down in my garage that will control the wattage sent up to the fan?